Having leftover roasted cauliflower on hand is a surprisingly common thing in my house – I'm a bit of a fan, and probably tend to subconsciously overcater. It's delicious in a grain salad with toasted almonds and plenty of fresh herbs, and, as I discovered one morning, makes a stunning open omelette. This is great breakfast fare, but it would also make a tasty and very quick midweek dinner. 1. Try substituting the cauliflower with rounds of leek. 2. For a vegetarian option, use a good drizzle of pesto instead of the chorizo dressing. 3. Cook the omelette in one large pan and cut into wedges to share. 1. Preheat the oven to 180C fan-forced or 200C conventional. 2. Cut the cauliflower into two centimetre wide slices and add to a large bowl. Add the onion, garlic and cumin, drizzle with oil, season with salt and pepper and toss to thoroughly coat. Spread on to a lined baking tray and roast for 10 to12 minutes until tender. 3. Add the eggs and cream to a large jug, season with salt and pepper and beat until combined. 4. For the chorizo dressing, heat the oil in a medium frying pan over high heat. Add the chorizo and fry until crisp. Add the almonds and cook until golden. Add the garlic and fry until fragrant and lightly golden. Take off the heat and stir in the vinegar. 5. Melt a knob of butter in a small non-stick frying pan over medium heat. Pour in a quarter of the egg mix and stir with a fork until it starts to set. Scatter some of the roasted cauliflower and onion evenly over the omelette and cook until the egg is just set. Repeat for the remaining mix. 6. 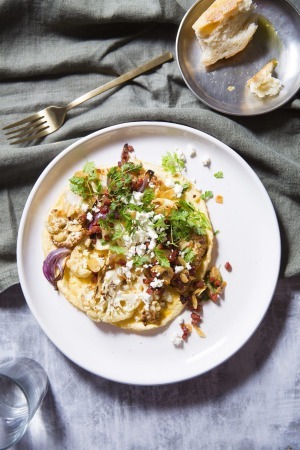 Spoon the chorizo dressing over the omelettes, crumble over the feta, scatter over the herbs and serve. Drink If you're having this for breakfast a cup of black tea will do fine, but if it's at the other end of the day, try a bright Spanish white like albarino or godello.